Select the necklace size of your choice. This stainless steel magnetic therapy necklace has matte silver O centers with shiny silver X accents, and is about 1/4" wide. 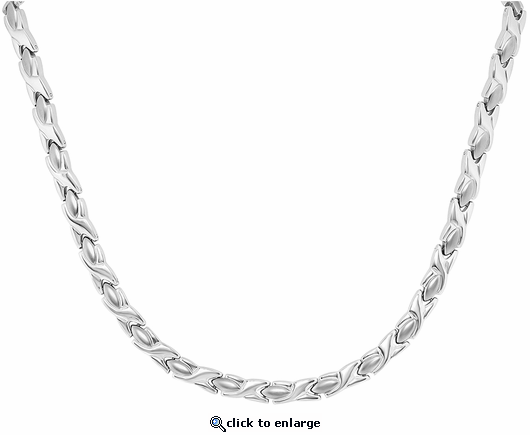 This hard to find magnetic necklace has a powerful & permanent 3300 gauss neodymium rare earth north facing magnet in each link. I love this 24 inch necklace! It lays so perfectly on my neck and ir slip over my head like a dream! I like the XOXO design and I am very pleased! I have had the matching bracelet for years & it looks as new as the day I purchased it. I rarely take it off. Treated myself to the matching necklace because I admired a friends she never takes off. When I first purchased a magnetic therapy item, it was for my ankle & unfortunately did not get it from Magnet Jewelry Store. It still keeps the ankle discomfort away but the anklet looks old & worn. Magnet Jewelry Store is the only magnet therapy jewelry I will recommend or buy. The customer service is 5 star as well. Very quick response if a problem & shipment is fast. I\\\'ve been wearing magnets every day for years due to degenerative disks in my neck and arthritis in my neck, shoulders, back, wrists and hands. I also have a cranky elbow. I\\\'m m only in my 50\\\'s but my body tries to convince me otherwise. If I don\\\'t wear them, by day 3 the pain is terrible... which is how I know they work! The company that I used to use is no longer in business so I took a leap of faith with this company. I was very grateful that this product is just as good and looks lovely. I wear dressy clothes to work and get compliments on my \\\"jewelry\\\" all the time. Magnets take the place of pain meds 90% of the time for me. Love the look of the necklace but after wearing for a couple of days I found that it was getting heavy around my neck and making it hurt even more. I have a really bad neck so it may just have been the weight and strain around the back of my neck. Darn !!! !